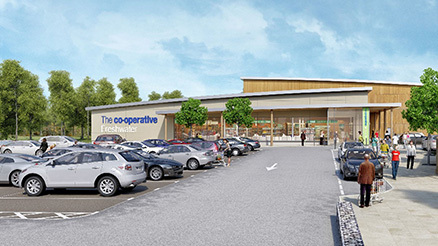 TPP have advised The Southern Co-operative in relation to their proposed new store at Freshwater on the Isle of Wight. The proposals comprise a new 2,137m² GFA Co-operative supermarket and 132 car parking spaces on the eastern side of the town to replace their nearby existing smaller store in Freshwater. TPP advised on all the transport aspects of the proposals including highway layout, access, servicing arrangements, car park layout and car and cycle parking provision. Also, in conjunction with the scheme, TPP negotiated the introduction of a 30mph speed limit on Afton Road adjacent to the site. The scheme was granted planning consent in November 2013.